You can read Part 1 of this tale here. Today’s new creation by me is the fab logo I created simply from some sketches I’ve been putting together from autopsy and slaughterhouse films. I had been really enjoying the exploration of biro, the confidence in knowing the next pen won’t cost a half day’s income. Biro goes everywhere, can do anything, it’s wilfulness to mercury can help spoil a background page, or pull a Steadman/McKean/Sienkiewicz grace dance. Paddy Brown‘s biro comics convey spontaneity first. 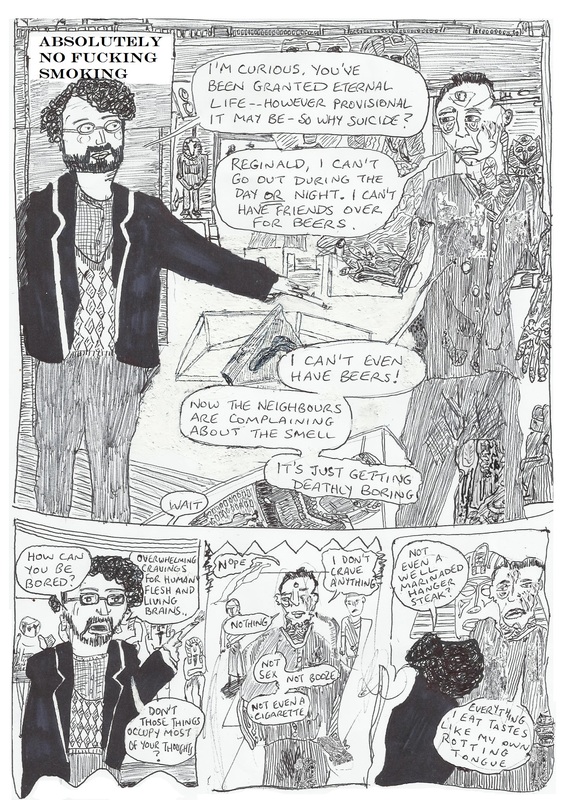 Though also the zine-comics movement, which deserts the pretension of blatant-commercialism. Though sell the fecking feck out of this if you’re sufficiently motivated.